Every day thousands of dogs assist people as therapy dogs. Many visit senior citizen homes and give residents something to look forward to each week. They literally wait for the moment a therapy dog walks through that door so they an lavish attention and praise on them. 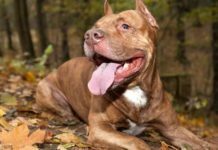 Pit Bulls serve as outstanding therapy dogs. The following story is one example of their remarkable diversity. Today I’d like to share the story of Hershey with you. Hershey is a therapy dog in Ontario, Canada. Since I don’t know Hershey personally I’ll let her owner, Jennifer Waite tell you her wonderful story. I was lucky and privileged to have Hershey adopt us about 3 years ago. I was volunteering for a rescue at the time called Barlee’s Angels Rescue Network and they had gotten in this special girl who was named Windy at the time. She was loved by every volunteer who met her and unfortunately they didn’t have a foster home for her so she was placed in a volunteers boarding kennel until a home was found for her. A request had gone out to spend some time with the dogs at the kennel and I went out to spend the day with Windy and another male pittie that was being held there. She melted my heart the minute I met her. Even though she was thin as a rail with her ribs sticking out she just layed in my lap accepting love and pats. When I put her back into her kennel area she walked up to the front and ever so gently placed her face alongside the gate for a last pet. The look in her eyes haunted me for days after. It was then I knew I had to help this girl. We fostered Hershey for a month and formally adopted her after that. She was about 6 at the time and had come into the group extremely thin, with nails that looked like they had never been clipped. She was grateful for any attention she could get even when the vet drew blood for her check-up. We found out she had been a breeding dog for a puppy mill and had been kept in a crate 24/7, never fed and when she had tossed out enough puppies the owner dumped her. Due to the over breeding and losing her babies the one small amount of joy she had was to carry all of her stuffed toys around with her and keep them all together in her bed when she slept. Her hips are quite bad from being contained all the time and we found out her jaw is fractured on both sides from some sort of past trauma (not sure I want to know from what) and she can only open her mouth to fit the size of a golf ball. Today she is about 9, happy, healthy, very loved and lives with her sister Reese’s who is an American Staffordshire Terrier, her little brother Twix, a 3.5 month old Brindle Pittie, 2 cats and the odd foster dog. In the beginning, she was very uncertain about open spaces (as she had been contained) and didn’t know how to play, didn’t know what toys were and just stayed in her bed all the time. With patience and love, she became a happy, secure loving dog who greets people with a smile every day. Her obsession is swimming and diving for rocks. Once in the water, it is hard to get her back out. She will dive underneath for up to 15 seconds looking for that perfect rock. All that is noticeable is her tail steering her around like the rutter on a boat. After locating the treasure it is brought back to shore and dropped at your feet to show off the newest find. Among her many wonderful charms is her new found stardom as a certified therapy dog with St. John’s Ambulance Therapy Dog Program in Southern Ontario. Hershey’s smile is ear to ear when her bandana goes on and she knows it is time for work. Off she trots to visit her friends at the senior’s home. Cookies are given out with lots of love and scratches. The visitors are full of stories of their day and kisses for Hershey and her therapy partner Miss Madigan, a beautiful fawn colored Bull Mastiff. Due to her outstanding service with the seniors and her restricted breed status in Ontario, Hershey was presented with an award from the Toronto Humane Society during Be Kind to Animals Week. She received a medal and a few newspapers and news channels carried her story including the Toronto Star, The Toronto Sun, and City TV. CTV highlighted her story with the seniors and it was shown throughout Ontario on the CTV news. Hershey has a remarkable ability to find the people who need her the most. If someone is not feeling well that day she will be at their feet for most of the visit. One time one of her regular seniors had to be put on oxygen to assist her breathing. When we arrived for the visit, Hershey went immediately to this lady and sat in front of her walker staring at the oxygen pump. With every pump, Hershey cocked her head to the side trying to figure what this new apparatus was. She then proceeded to walk over to sit beside her friend and place her head on her lap as if to say, “I’m not sure what is wrong but I’m here to help”. Hershey sat there for most of the visit. This dog is a wonderfully warm, patient creature with a heart of gold and has a smile and a wag for every man, woman or child she meets. She is a special soul and has changed many people’s opinions on the breed. She has attended many dog shows or special events only to be on her back the entire time with her four paws up in the air looking for belly rubs. 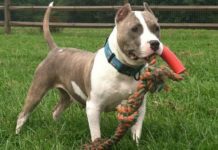 To be judged for her breed is a horrific situation and is very heart-wrenching. When we go out in public people cross the street when they see us coming, families have pointed her out and told their children, “these are dogs you have to stay away from.” Growing up as a child my parents taught me to never judge a book by its cover…you must look beneath to discover the true meaning of a person. It is unfortunate that we must now move out to the country to give Hershey and her family some private spaces and freedom to run around without being persecuted for the beautiful creature that she is. Thank you, Hershey, for sharing your life with us and showing me what a loyal, comical breed Pit Bulls can be. I will never live without one in my life. 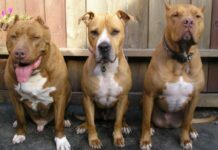 Jennifer Waite proud owner of 3 perfect Pitties. I don’t know about you but every time BSL is brought up I can’t help but think about Pit Bulls like Hershey. 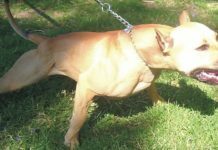 Hershey and other Pit Bulls and Pit Bull mixes suffer greatly. 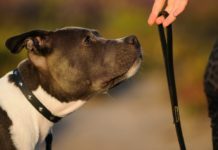 While the current laws grandfather any current Pit Bull residents in, the law does require they be leashed and muzzled at all times. Because of Breed Specific Legislation Hershey will no longer be able to be a Therapy Dog in Canada. 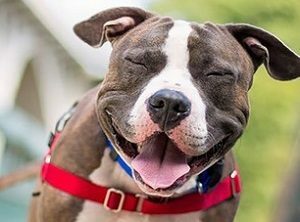 Sadly, Hershey along with all of the Pit Bulls and Pit Bull mixes are going to be removed from the Therapy dog program by August 29th this year. 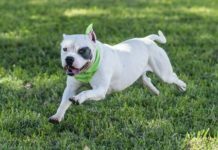 Breed Specific Legislation, people’s irrational fear, and the media hype effectively snuffed out the joy these dogs bring to people through their therapy work. I don’t even know Hershey or any of the Pit Bulls in Canada, but I feel deeply hurt by the fact they will no longer be able to comfort folks who look forward to their loving presence. Hershey’s story reminds me why I love American Pit Bull Terrier’s so much. Their capacity for love is immense and admirable. We can learn so much from the example they set for us every day.